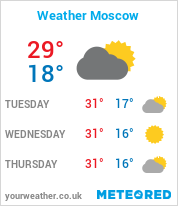 At present it is difficult to talk about what kind of weather waits for fans in Russia in late June - early July, says specialist of the weather center "Phobos" Alexander Sinenkov. However, according to him, if we proceed from statistical observations of the weather during this period, then we can talk about the average value. - The average daytime air temperature in June is 22 degrees, in July - 23 degrees. The night temperature is 12 and 14 degrees, respectively. If we talk about precipitation, then in June 11 (rainy) days, in July - 12. The end of June - the beginning of July - is the time when the grasses bloom, for example, timothy and fescue. - Allergy sufferers who come to the championship should know that they will get into this period, - says the allergist doctor Valentina Gevorsieva. "But I think they themselves know what to do." In any case, our doctors will help. Therefore, there are no problems here, nothing is worth to be afraid of. According to her, the rainy weather at the time of the World Cup suffering from pollinosis will only be on hand. - Of course, football can be prevented by rain, but it will kill dust and pollen, - the doctor noted. Since the climate of the Russian capital is almost no different from the climate in Europe, there is no need to worry about acclimatization. However, there are things that you should pay attention to while visiting another country. - When changing the time zones, there is usually insomnia. It's not scary. If you can not sleep, then you need to ventilate the room or turn on the air conditioner for a while. Since the blood circulation slows down while falling asleep and the body temperature falls, then with the help of this maneuver you can deceive the body. Disorder of the intestine. Russian cuisine likes to surprise, so the body will take some time to get used to the new food. - Sweating is more typical for countries with hot climates, however, the body may take time to adjust to local weather. Also, because of the new climate, a runny nose and chills may occur. You should not worry, you can drink vitamin C.
- We need a passport. We remind you that the stadium will not be missed without presenting an identity card. - A raincoat should be taken depending on the circumstances. Although the capital's stadiums, which will host matches open, fans will protect the canopies from possible weather. But after the match you will have to get home again. - The decision to take a sweater with you should be taken based on the weather forecast. Before the match is worth checking it, so as not to load yourself with unnecessary things.